Toro!! The Bull in Human History, Art, and Sports will explore the importance of the bull throughout our history. 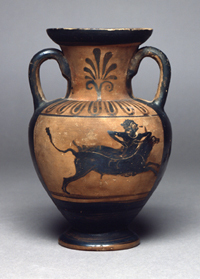 The first section of the exhibition considers the bull in ancient French, Mediterranean, near Eastern and Egyptian cultures, including an example of the first known sport, bull jumping, from the Minoan culture of Crete. The second section explores the Spanish sport of bull fighting through the work of Francisco de Goya y Lucientes and Pablo Picasso. The third focuses on the American rodeo sport of bull riding through historic and contemporary photographs, artifacts, and video. 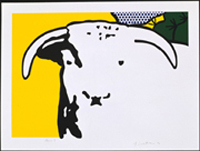 The last section considers the bull in modern and contemporary art and will include the work of Isadore Bonheur, Picasso, Red Grooms, Roy Lichtenstein, Garry Winogrand, and others. Regional artists include Montana painter George Gogas and Wyoming artist Eric Ringsby. Funded in part by FMC Corporation, Murdock and Associates Law Firm, the Wyoming Council for the Humanities, the Albany County Tourism Board, Chevron Products Company, ExxonMobil Production Company, Wyoming Public Radio, the UW Office of Academic Affairs, and the National Advisory Board of the UW Art Museum. In today's rodeo, bull riding is billed as America's first extreme sport. What began as cowboy contests on the ranchlands of the West and entertainment in the Wild West Shows of the late 19th century has evolved into one of our most thrilling and popular professional sports. With it comes high personal risk and high dollars. Rooted in cowboy culture and accompanied by strong religious convictions, bull riding is a contemporary manifestation of the iconic bull, its historic antecedents not too far in the wings. From our earliest Paleolithic depictions of animals, the bull has been associated with the attributes of power, fertility, strength, courage, and stamina. Our relationship to this noble and elegant animal has evolved along belief systems and symbolism that test our physical, mental, and emotional skills. Mythological contests between heroic male figures (minor deities in the formal cosmology of the period) wrestling with bulls suggests an early association of bulls with power and control. In ancient Egypt, the bull symbolized royal power and authority, and the sacred Apis bull was considered a vehicle for the deceased. The bull cult of the Mediterranean region is best known by the late Greek myth of the Minotaur, the half man/half bull creature. Greek mythology also connects the bull to the constellations through the legend of Zeus and Europa. The first acknowledged "sport" with bulls is depicted in the acrobatic performances of youthful Minoan men and women on the island known today as Crete. Bull leaping may have been a part of bull sacrifices and fertility rites important to their belief system. In medieval Spain, the hunting of bulls evolved into demonstrations of skill, courage, and power by nobility and, later, into the profession of bullfighting carried out in the plazas de toros throughout the country and beyond. Artists throughout history have embraced and acknowledged the importance of the bull as an animal, symbol, myth, and metaphor important to their culture. Toro!! The Bull in Human History, Art, and Sports explores these cultural, economic, religious, and visual significances of the bull. Funded in part by FMC, Murdock and Associates Law Firm, the Wyoming Council for the Humanities, the Albany County Tourism Board, Chevron Products Company, ExxonMobil Production Company, Wyoming Public Radio, the UW Office of Academic Affairs, and the National Advisory Board of the UW Art Museum.